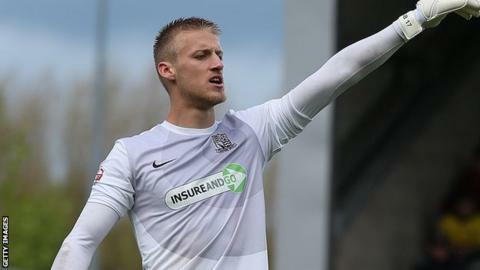 Southend United extended their unbeaten run to five games in League Two with a goalless draw against Plymouth. Ryan Leonard went close early on for Southend but his driven effort went narrowly over the bar. Plymouth's best chance of the first half fell to Lewis Alessandra, but his low shot was outstandingly saved by the legs of Southend keeper Daniel Bentley. Tom Flanagan and Reuben Reid hit the bar in quick succession late on for Plymouth as the game ended in a draw. Southend, who have now drawn their last three home games in League Two 0-0, remain in sixth place, while Plymouth are two points behind in seventh position. Match ends, Southend United 0, Plymouth Argyle 0. Second Half ends, Southend United 0, Plymouth Argyle 0. Corner, Southend United. Conceded by Tom Flanagan. Corner, Southend United. Conceded by Carl McHugh. Substitution, Plymouth Argyle. Nathan Thomas replaces Lewis Alessandra. Lewis Alessandra (Plymouth Argyle) wins a free kick on the right wing. Substitution, Southend United. Will Atkinson replaces Shaquile Coulthirst. Jerome Williams (Southend United) wins a free kick in the attacking half. Attempt missed. David Worrall (Southend United) left footed shot from the centre of the box misses to the right. Reuben Reid (Plymouth Argyle) hits the bar with a left footed shot from the left side of the box. Andy Kellett (Plymouth Argyle) hits the bar with a left footed shot from the right side of the box. Corner, Plymouth Argyle. Conceded by Ben Coker. Tom Flanagan (Plymouth Argyle) wins a free kick in the attacking half. Corner, Southend United. Conceded by Reuben Reid. Attempt saved. Jerome Williams (Southend United) header from the centre of the box is saved in the centre of the goal. Ryan Leonard (Southend United) wins a free kick on the right wing. Corner, Southend United. Conceded by Curtis Nelson. Corner, Southend United. Conceded by Anthony O'Connor. Attempt saved. Reuben Reid (Plymouth Argyle) left footed shot from the centre of the box is saved in the centre of the goal. Substitution, Plymouth Argyle. Dominic Blizzard replaces Jason Banton. Substitution, Southend United. Myles Weston replaces Jack Payne. Hand ball by Lewis Alessandra (Plymouth Argyle). Shaquile Coulthirst (Southend United) wins a free kick on the left wing. Attempt missed. Joe Pigott (Southend United) right footed shot from the centre of the box is just a bit too high.